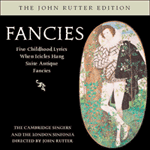 When icicles hang will forever be associated in my mind with the much-missed figure of Russell Burgess, whose Wandsworth School Boys’ Choir was such a colourful and inspiring part of the musical scene in the 1960s and 70s. Russell asked me to write a seasonal but not specifically Christmas work for a December concert given by the choir in London’s Queen Elizabeth Hall in 1973, and, in writing it, I think I unconsciously reflected some of the contradictory facets of Russell’s endearing personality: his rumbustiousness in Good ale and Hay, ay, his gentleness in Blow, blow, thou winter wind, perhaps also something of his underlying melancholy (so often to be found in great men of action) in Winter wakeneth all my care. We all lamented his untimely passing at the age of only 48, but his work lives on in the gift of singing he gave to so many young people. Of this worldes joy, how it goeth all to nought. All goeth but Goddes will. All we shall die, though us like ill.
Now it falloweth all bidden. Ne how long here dwell. Make we merry as we may. Is mirth and gamen, I dare well say. And make as merry as we may. Fill the cup, Sir Botelere! This ends my carol, with care away!